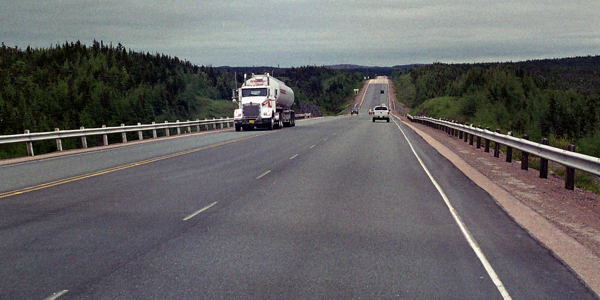 The Trans-Canada Highway (Route 1) crosses Newfoundland west to east from Port aux Basques to St. John's, a distance of 905 kilometres. Secondary highways along the route provide many fascinating, "off-the-beaten-track" side trips. Generally the roads are in a good condition, but always be alert for black holes or bumps, for every winter the roads sustain considerable damage by frost. During the winter, all primary highways are kept open except for short periods during or immediately after a severe snowstorm. The Department of Transportation and Works has installed a number of digital cameras along the Trans Canada Highway and some other major roads, in an effort to provide the motoring public in the province with the most up-to-date road and driving conditions. See the website http://www.roads.gov.nl.ca/. 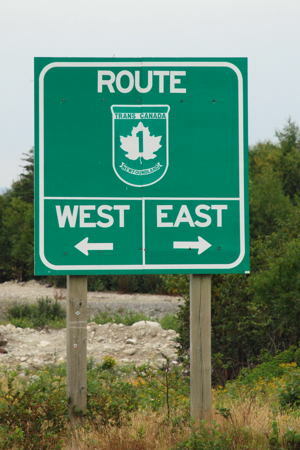 Road sign along the Trans Canada Highway. A free highway map is available at most Tourist Information Offices or can be ordered at The Government of Newfoundland & Labrador. There are about 110,000 moose on the island of Newfoundland, and most highways go through good moose habitat. Moose are great to look at - from a distance. If you see one on or near a highway, use extreme caution, slow down and prepare to stop. Like all wild animals, moose are unpredictable. Be sure the moose has either crossed the highway or gone back into the forest before resuming your drive. Also, if you see a vehicle stopped on or near the highway, the driver may have spotted a moose, so be cautious. Avoid driving at night if possible as most moose vehicle accidents occur between dusk and dawn. If you must drive at night, slow down. Scan both sides of the highway with your lights on high beam unless overtaking other traffic, and pay attention to warning signs. A road sign like "Caution, moose next 11 kilometres" means moose cross there frequently. Drivers must carry a valid Driver's Licence, Vehicle Registration Certificate and Proof of Liability Insurance Coverage. Legislation requires that motorists carry lump-sum public liability and property damage insurance of $200,000. The driver and all passengers must wear seat belts. Radar detectors are illegal. It is illegal to drive with a blood alcohol limit exceeding .05 per cent. The major car-rental firms (Avis, Budget, Hertz, Rent-a-Wreck, Thrifty) are plentiful at the airports and main towns. Islander RV Sales & Rentals is one of the largest dealers in the Atlantic region. At Islander RV Sales & Rentals they have a variety of units in their rental fleet including camper vans, class C motor homes and travel trailers. There is no rail travel on Newfoundland. The ferry to Fogo and Change Island. and from Shoal Arm to Little Bay Islands. South East Bight (from Petit Forte). Go to the website Provincial Ferry Services for further information and schedules. Air Canada jazz, Provincial Airlines, and Air Labrador provide regular air service within Newfoundland and Labrador. Air Labrador also offers service through St. Anthony to many points in Labrador. Provincial Airlines also offers service to the French island of St. Pierre.